Five students currently study the double bass, receiving three lessons per week from their principal teacher and taking part in a class lesson. In addition, the majority of the bass students travel up to the Royal College of Music on a Saturday morning where they play in one of the Junior Department's orchestras. The School aims to have at least four bass players at the school at any one time. The school recognizes the positive aspect of learning with others in a supportive environment where the challenges of playing the bass are respected. Pupils recently have come from England, Spain and Turkey. Having an international reputation as a teacher of all age groups, including the largest bass class at the RCM for over ten years now, Caroline Emery's contribution to the double bass world is unique. After graduating from music college and subsequently gaining a teaching qualification, she became the leading exponent of the Yorke Mini-Bass Project from its inception in 1984. Since then she has taught in state schools, independent schools and privately. The European String Teachers Association and the International Society of Bassists have provided a platform for her work to be demonstrated internationally and this, coupled with the enormous success of her first Yorke Edition publication 'Bass is Best' in 1988 led to her taking pupils as far afield as America and Norway. She has coached the National Youth Orchestras of both Norway and Nordic Lands. The Bass Club which she founded facilitates an exchange of ideas both within Britain and between other countries. She was appointed to the Junior Department at the RCM in 1985 and was appointed to the professorial staff of the RCM in 1995. In 1991, she became the first ever double bass teacher at the Yehudi Menuhin School. Caroline received a special achievement award for teaching from the International Society of Bassists in 1997 and was awarded Honorary Membership of the Royal College of Music in 2000. Caroline's recent professional playing engagements have included two orchestras in Sweden, the Orchestra of the Age of Enlightenment and the Liverpool Philharmonic Orchestra. She is also a founder member of Vent, a period instrument chamber music ensemble. Caroline's students are now working with all the major orchestras in England including LSO, BBC Concert and Philharmonia as well as orchestras in Sweden, Germany and the Concertgebouw in Holland. Many of her students have won trials in the Liverpool Philharmonic, BBC Symphony and Concert Orchestras, Royal Philharmonic, BBC Welsh, ENO, BBC Scottish and the Philharmonia. Full Positions are held in the LSO, BBC Concert, Malmo Symphony and Norlands Operan Sweden. After winning a National Lottery bid for commissioning new music, Caroline's passion for new repertoire has been increased and she has enabled some 40 new works for double bass to be written including four concertos. Jan Alm's second quartet for basses went on to win the International Society of Bassist's Composition Competition in 2001. Double bassists undertake tuition as solo performers in much the same way as other instrumentalists in the School. Careful attention is paid to posture, technical development and ensemble training. The bass can present great challenges and attention to the physical development, and suppleness of the pupils is always uppermost. In the Spring Term all pupils study solo Bach performance. We aim to play the cello suites at pitch and this encourages a high level of technical commitment to be able to enjoy the playing of Bach. Regular contact time with the teacher is important and our pupils benefit from three hours of individual lessons and a class hour every week. As well as the individual lessons bassists attend a class where orchestral extracts are discussed and chamber music is performed. Especially commissioned works for Bass Quartet, Quintet, Trios and Sextets are studied. The School works closely with Bass Club which Caroline Emery directs. The Headmaster was advisor to the Bass Club’s successful Lottery Bid to commission new works for bass. 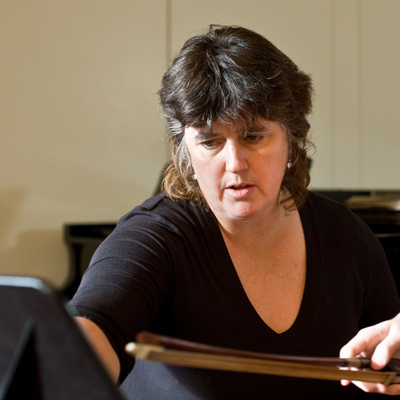 Caroline Emery has been responsible for commissioning over fifty works for bass ensemble, including four Concertos and four Octets. Pupils who play Jazz are encouraged to do so if they find it a satisfying and enriching experience. Now that the School teaches Guitar, the school has encouraged the creation of rock and jazz groups. A Jazz trio is often arranged and plays at the main social events at the school. Recently one bass player was appointed the main bassist with the National Youth Jazz Orchestra while in his first year at Music College even though he is studying classical bass. The nature of the bass repertoire encourages the study of orchestral repertoire. For this reason the School enjoys a close link with the Royal College of Music where Caroline Emery also is Professor and the senior teacher in the Junior Department. As part of their curriculum the bassists benefit from rehearsing and performing with the Symphony Orchestra at the Junior Department at the Royal College on Saturdays. Bassists are therefore released from regular School commitments to enable them to attend the Junior Royal College of Music. Repertoire studied recently has been Sibelius’ Second Symphony, Prokofiev’s Lieutenant Kije Suite, Britten’s A Young Persons Guide to the Orchestra and Shostakovich’s Fifth Symphony. There are usually ten members of the Junior Department’s Symphony Orchestra. The School also has its own String Orchestra where bassists can develop to a very high level as ensemble players. The School has had a tradition of teaching French bow but in the last few years pupils have been using either French or German bows. More recently the German bow has been used by the majority. Potential is always looked upon as the most essential quality and pupils can use either bow. At audition candidates should aim wherever possible to play on the instrument that they know best. However if candidates are flying in from overseas and encountering difficulties they should contact the School for assistance. The School owns a variety of good instruments. However, it is good for a pupil to own their own bass and to begin studies on what is familiar, but the school collection is there to expand choice where and if it is advised. Of adult size the School has a Quenel copy made by Horst Grunert and an Etude made by Christian Laborie. The School also owns a high quality Wilfer quarter size with sloping shoulders to enable the training of young players. The School also has access to a very fine half-size bass made by Horst Grunert. Further eighth and quarter sizes can easily be sourced. The School is always looking to develop its stock of instruments. The School owns a carbon fibre flight box. Tim Gibbs was the first bassist to be accepted by the School in 1991 and he went on to win the International Society of Bassists Young Bassists Competition and was a finalist in the main solo competition at the same time in Houston 1997. He gave his debut recital at the Wigmore Hall aged 20 whilst continuing his studies with Caroline Emery at the Royal College of Music. Tim has now accepted a post with the Philharmonia Orchestra but has professional experience with the LSO, BBC Symphony, BBC Scottish and Welsh, Halle, and ENO. He has leading experience with the BBC Philharmonic, RPO, BBC Concert Orchestra and in Japan. Other past pupils include Alex Scott and Georgina Poad who hold positions in the Munich and Concertgebouw Orchestras. Elena Hull is a busy freelancer in London with professional experience in the Liverpool Philharmonic and as Assistant Principal in the RTE Orchestra. She is also teaching a large class of young Double Bassists with Caroline Emery at the Junior Department at the Royal College of Music. Paul Ellison, Professor of Double Bass at Rice University in Texas visits at least once a year. Francois Rabbath has also visited on several occasions and has given recitals to the school. Jan Alm of Gothenburg Symphony and Professor at Goteborg University also visits regularly.